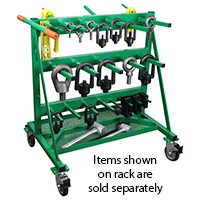 IMS Select Hoist Ring Rack, Mobile Hoist Ring, Eyebolt, Lifting and Rigging Utility Cart. All Welded Steel Construction. Painted Green. (4) Swivel Locking Casters. Includes Push Bar with Rubber Grips, (25) Various Sized Hanging Posts, and (2) Reinforced Mesh Tool & Part Trays.